Omnisphere 2 is an absolute triumph of virtual instrument design, perfect for those looking to create exciting new sounds. Load your own samples! New synth oscillator shapes are fantastic. Redesigned browser works a treat. Granular mode is useful. Loads of great new presets. External sample editor required to loop User Audio. Presets still so loud they clip the master! Improving on the universally lauded Omnisphere must have felt like an impossible task, but Spectrasonics has truly outdone itself with version 2. Not only does it improve on the original, it takes it into an entirely new - ahem - sphere. The original Omnisphere took the 'samples and synthesis' approach to sound creation dating back to 1987's Roland D-50 and reinvented it for the 21st century. With its huge audio soundbank, exciting new sound-shaping systems, easy browser and powerful virtual analogue architecture, it was a sound designer's dream come true in 2008 - and, indeed, still is. However, it's always suffered from one notable limitation: you could only use the included audio material, with no way to import your own. "Running your own sounds through Omnisphere's incredible synthesis engine is enormous fun"
Understandably, then, the most anticipated improvement for many in Omnisphere 2 (VST/AU/RTAS/AAX), is the ability to feed its engine with your own 'User Audio' - ie, samples. As great as this news is, though, the implementation is very basic. There's none of the sophisticated zone or velocity mapping that you'd expect from a full-on sampler, and while it's understandable that Spectrasonics didn't want to overcomplicate its feature-packed synth, some form of looping functionality would have at least made this feature far more useful. As it stands, if you want your samples to loop, you'll need to embed loop points in an audio editor such as WaveLab or Sound Forge first - a real inconvenience. No doubt about it, the ability to loop User Audio files (ideally with crossfading) would really unlock Omnisphere 2's potential, and we hope it comes in an update. Lack of sample looping aside, User Audio works beautifully, and it's compatible with WAV and AIF files (8- to 32-bit). Running your own sounds through Omnisphere's incredible synthesis engine is enormous fun, and the creative potential is immense, especially when you factor in the Oscillator section's new Granular Synthesis algorithm. We're sure that for some v1 users, the addition of User Audio alone will be worth the upgrade price. The next biggest new feature in Omnisphere 2 is its expanded library of oscillator wavetables, bumping the original's measly five up to a jaw-dropping 400, each with a Shape parameter to control the wavetable position! The wavetables are divided into three types: Classic Waveforms, Analog Timbres and Digital Wavetables. Classic Waveforms are mostly based on raw hardware synth waves, and their wavetables are pretty straightforward, typically morphing between sawtooth and square or triangle shapes, much like the waves in the original Omnisphere. The Analogue Timbres are more involved, approaching the level of complexity found in Massive's wavetables; and the Digital Wavetables will delight fans of EDM, DnB and dubstep with their grungy tones and complex harmonic movement. Factor in the oscillator Symmetry and Hardsync parameters, and you have a near-endless array of base timbres. Among the many other improvements to the Layer section are eight new filter types, enhanced FM and ring modulation (both now have Shape, Symmetry and Sync controls), analogue-style unison drift, polyphonic LFO and Modulation Envelope options, and Soundsource Reversing, which makes any Soundsources (Omnisphere's raw samples) play backwards. 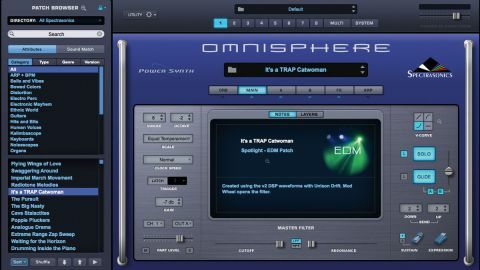 "Omnisphere 2 is a tremendous follow-up that takes the synth to the next level and beyond"
Less dramatic enhancements include a note transposition sequencer, speed offset and new modulation capabilities for the arpeggiator, and 25 new effects, including a wealth of distortion and modulation processors, Crying Wah, Precision Compressor and more. Of particular note is the excellent Innerspace, which transforms even the simplest signal into a creepy atmosphere via a selection of what appear to be impulse responses, two of which can be used in a single effect, for unique, unnerving soundscapes. The FX section itself has also been improved, now allowing for a whopping 16 FX units per patch, matrix modulation of every FX slot, and an Aux(iliary) FX rack per patch with pre- and post-fader sends. The new Omnisphere browser becomes even more helpful than it already was with Sound Match, which finds similar patches to the one you're using, and Sound Lock, which makes selected parameters immune to preset changes. Live performers will dig the new Live Mode with key split function, and the Orb's new Attractor mode causes the 'cursor' to move in a pendulum-like fashion. There are plenty of lesser additions that we don't have the space to go into here, too, such as Boolean search options and global clock speed control. Last but by no means least, there are the new patches - more than 4500 of them, including a bank dedicated to teeth-grinding EDM sounds - and fresh Soundsources, including circuit-bent, psychoacoustic and custom-built instruments. It's a veritable embarrassment of riches for sound designers, and the new browser enables you to view just the new patches on their own, making them easy to audition. Ultimately, Omnisphere 2 is a tremendous follow-up that takes the synth to the next level and beyond. If being at the cutting edge of sound design appears anywhere on your list of music production priorities, it's an instrument that you simply have to own.